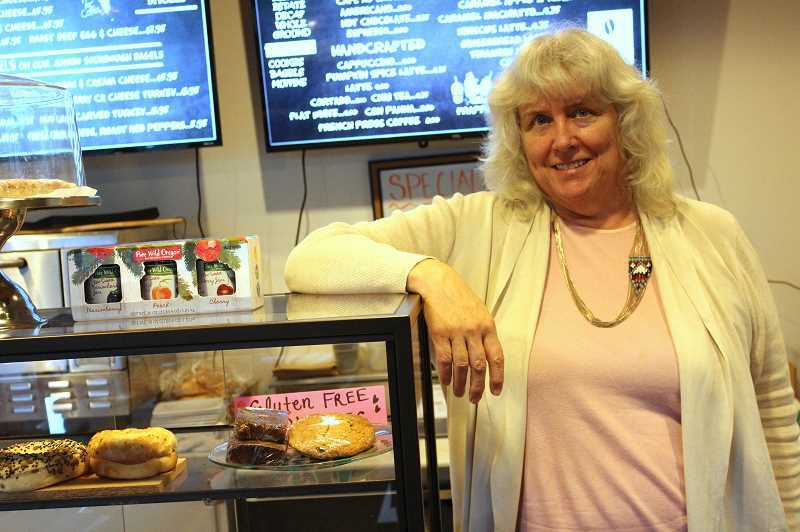 In talking with members of the Wilsonville Chamber of Commerce and the City of Wilsonville while looking into signing a lease for her new business, Wilsonville resident Nancy Faubel heard that officials were interested in bringing in more independent stores and restaurants to town. "They want to get away from the chains you can find in every other town," Faubel said. And Faubel's new shop, Corner Coffee Shoppe at 8255 S.W. Wilsonville Rd. next to Safeway, fits this description. The coffee shop, which opened several weeks ago, offers a homemade and varied array of pastries, bagel sandwiches, lattes and other morning pick-me-ups. "Being an independent (shop) we can do whatever we want," Faubel said. "We're much more responsive to customer requests." Faubel took a unique path to the new venture. While running a flight school in West Virginia many years ago, she made an agreement with a chef at the local Sheraton hotel: The chef would teach her how to cook and she would teach him how to fly. "He's the first one that ever told me mistakes stay in the kitchen," Faubel said. Faubel always enjoyed fine-dining but began taking a deeper interest in cooking following the handshake agreement and eventually made a sourdough bread starter out of the yeast derived from grapes. Though she ran flight schools in three states, 18 years ago Faubel decided to switch to a much less dangerous career. For the last 15 years, she ran a coffee shop in Winchester Bay, a town of about 400 people in Oregon. "Coffee isn't life and death. I had a couple close calls in aviation and had a feeling it was time to get out of it," Faubel said. With Winchester Bay mostly a vacation town, she wanted to move somewhere with a more stable customer base and thought Wilsonville might be a good place to set up shop. "When I wanted to move to a bigger place Wilsonville was number one on the list," Faubel said. "Being on the I-5 corridor is nice and having public transportation is nice. There's things to do, community involvement; it seems like the perfect fit." Corner Coffee Shoppe's menu items include danishes, lemon poppy-seed and blueberry muffins, seasonal turkey and cranberry bagel sandwiches, gooey chocolate cookies and a white chocolate and butterscotch latte. However, Faubel said the menu is malleable. "We're very interested in people telling us what they want and then (us) providing it," she said. Along with the coffee shop, Faubel also owns Pure Wild Oregon, which sells speciality jams, barbecue sauce and other artisanal items. "We're still playing around with things trying to figure out how to incorporate products we make into menu items," Faubel said. She roasted coffee at the old coffee shop in Winchester Bay but left her roaster there when she moved to Wilsonville and plans to acquire a new roaster soon. Currently, she buys coffee from Nossa Familia Coffee. The shop's decor includes black walls, comfortable seating,world globes, paintings and a bookshelf. "I had the decor designed for me by a guy that does cafes out of Los Angeles. He asked me what kind of feel I wanted for the place. He helped me find something that would be different from what else is here but kind of a trendy, happening vibe to it," Faubel said. Though the shop sells mostly breakfast and lunch items, Faubel hope to attract a nighttime crowd as well. She has hired guitarists and other musicians to perform on weekends and is looking into obtaining an alcohol license and baking more dessert foods. "When I was in Lake Tahoe there was a movie theater right next to the coffee shop," Faubel said. "The movie theater was really busy at night and a lot of people would come in for coffee before they went to the movie. There's a market (in Wilsonville) for people shopping at night and going to movies." Faubel has participated in Chamber of Commerce events, plans to sponsor a local softball team and wants to become more ingrained in the community. And she wants customers to feel at home when they enter her shop. (I want customers to feel) a sense of connection with the owner and the staff, a sense of community," Faubel said. "We're getting involved with as much in the community as we can." For more information about Corner Coffee Shoppe, visit its Facebook page at www.facebook.com/CornerCoffeeWilsonville/.